If there’s one thing 2016's tumultuous political events and their aftermaths have exposed, it’s the extent to which Britishness as a concept can mean radically different things to different people. This show opens in the week after Article 50 was triggered to begin Britain's official divorce from the EU. The UK has started its self-inflicted, headlong tumble into the great unknown, either with soon to be vindicated foresight or xenophobia-fuelled sentimentality, depending on your point of view. It feels like the start of an apocryphal era, one that's exposed a deep and brutal fissure that runs between leavers and remainers, splitting families, couples, generations and regions. In an ideal world, we'd all have learned to strike the delicate balance between real geopolitical progression through keeping a firm eye on the future while learning from historical mistakes, between valuing and respecting the past without romanticising it. 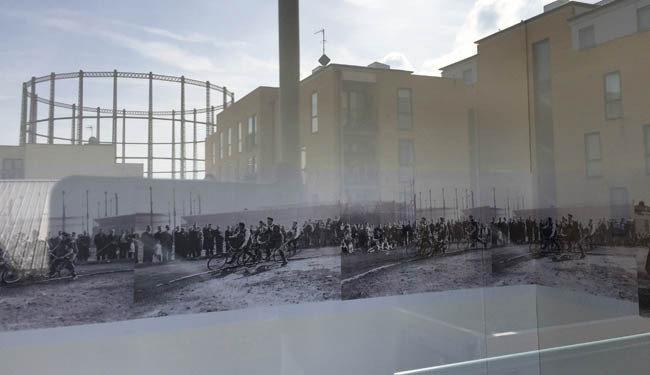 It seems a highly prescient moment for a show inspired by an activity from a 'golden era' – the post-war age of innocent, heady, ad-hoc fun embodied by the spirit of cycle speedway that took place on the site now occupied by Regent Studios. Speedway's commissioned artists all use the past – from the 19th century until as recently as last month – as their source material. James Roseveare, Luci Eyers and Andrew Kötting all take the supposed solidity of history and the process of historicisation as rich artistic fodder, interrogating them to decidedly idiosyncratic ends. James Roseveare's Surface Below, Surface Above and its three wall-based companions are made using debris swept and collected from the streets around Regent Studios before being encased in concrete. Coloured aquarium pebble, nails, polystyrene, cloth, twigs, vacuum cleaner dust and bone are listed as the most recognisable of the sculptures’ mediums, with some of these elements positioned by the artist and others left to do their own thing. All four pieces present us with a solid reflection on what we preserve from the past brought bang into the present, an encouragement to consider the differences between what we value and what we're conditioned to value. Roseveare includes seeds with the potential to germinate in his material cacophony, a gentle, optimistic nod to the life that can spring from the apparently long-dead. Eyers' animations, meanwhile, takes a very different form of local history as a starting point. Eyers often uses politics as a springboard for her work, though this is usually far from evident in the finished pieces. In Wall, two pencil-animated women repeatedly clamber over a wall rendered by a single stroke of watercolour, their drawn bodies still visible through their era-less clothes left intentionally transparent, though the line of the animation itself and their slightly awkward actions are confident and robust. In Swing, the larger, swaying woman projected onto the gallery wall has a similar sense of fluidity achieved through Eyers' skilfully-wrought lines, her feet softly hitting the gallery's architecture with every upward movement. All these characters are unmistakably women rather than girls, the result of the artist's investigations into the local Magdalene Home that once stood at the site of the car pound next door to Regent Studios. Artist filmmaker Andrew Kötting's Klipperty Klöpp and its freshly made companion Klipperty Klöpp2 offer a whole other take on what it means to historicise, to remake, to revisit. Made in 1984 while Kötting was still a student at the Slade School of Art, the original Klipperty Klöpp now occupies a seminal position in the history of artists’ film. In turns folkloric, Beckettian, Python-esque and with a less than subtle, parodic nod to the land artists that were so popular in the early 80s, the film was shot on found Super 8 stock and given a suitable voiceover inspired by post-surrealist 'automatic ranting.' Its remade companion piece, shot in crisp HD in March 2017, features a female Japanese protagonist in the role originally taken by Kötting – an intentional, feminising gesture that builds on his ongoing interest in degendered retellings of history.